Friedemann Friese has designed a wide variety of games, from party games to heavy economic games, and as a result his whole oeuvre isn’t a fit for many gamers – but by the same token there is likely a Friedemann Friese game for nearly everyone. The trick, then, is figuring out whether a new Friese game is one for you or not. That difficulty was amplified at Essen in 2010, as he contributed to a half dozen designs. One of those was Fürstenfeld. Fürstenfeld is part of the big box 2F Spiele / Rio Grande line, so the green box tends to make one think of games such as Power Grid or Factory Manager. But Fürstenfeld, while also an economic game to some extent, doesn’t have quite the same focus as its predecessors. Here, players have just six spaces to utilize, first to make money and eventually to build a palace; the first player to complete all six pieces of the palace wins. 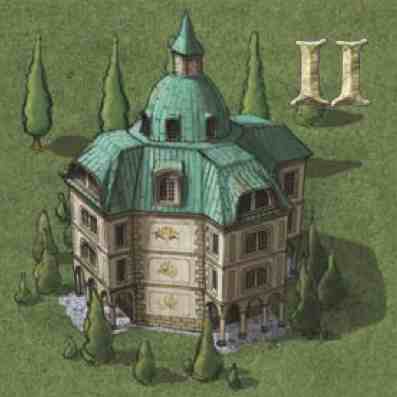 The game includes both a basic game and an advanced game; the primary difference is that in the advanced game the components of the palace must be built on specific spaces. Those who have played both versions strongly recommend the advanced game, so this review will focus on that version. The mechanisms of the game are simple. Each turn, players draw three cards, and produce hops, barley, and water. Then, starting with the player who earned the least money on the previous turn, players sell their goods to the breweries (for between 1 and 3 each), mark their income (to determine the player order for the next turn), purchase up to two cards (with sections of the palace starting at a cost of 8, and increasing over the course of the game), and discard down to a single card. At the end of the round, the brewery markets are adjusted, offering more for goods that weren’t fully delivered during the turn. If one or more players completes their sixth palace section, the player with the most money left over among those who have completed their palaces wins. The heart of the game is the cards. In addition to the six palace segments, there are production cards, other cards which generate income, and a small number of cards impacting other phases of the game. The nine production cards, which generate one, two,or three of the good shown, are provided in addition to a base production of one good of each type. The other economic cards include banks (which earn a fixed income), a market (which allows goods to be sold as other types of goods), and an office (which allows a player to sell one type of good at a premium). Other cards provide discounts on cards, extra draws, income adjustments, and even the ability to hold onto more cards from one turn to the next. I had the opportunity to play Fürstenfeld as a prototype, and enjoyed it, but I wasn’t really decided as to what I thought about the game. Even once the published game arrived, it took a few plays for me to figure out just what I thought of it; it was neither an obvious hit nor an obvious miss. There are a number of things I like about the game. First and foremost, there are interesting choices. While not all of the cards are useful, there are enough useful cards, and enough variety in their functions, as to leave the player with non-trival choices. The theme, while not closely integrated with the mechanisms, is fresh, and the mechanism of having the player who earned the most in one turn go later the next turn works very well. But there are a number of components of the game I have issue with. The markets are generally far too forgiving – I’ve never seen players generating enough goods as to really cause prices to drop. Part of the problem is that the cards which produce goods are very expensive, discouraging their purchase – particularly in the advanced game, where they may need to be covered over before they’ve fully paid off. Since the market can absorb twice as many goods as the initial production, even if players focus on that aspect, it takes a while before the market can’t keep up with the production. A _particular_ brewery can be oversupplied, causing prices to drop their, but that inflates prices in the other breweries. This in turn makes the warehouse of little value in most cases. Worse, I’ve consistently seen the winner complete their palace the second time through their deck, so any palace section discarded a second time is a concession of defeat. And that means that there’s not a lot of variety in the game – which, for me, means that it’s a game that I was done with after four plays. One of Friese’s signatures is original mechanisms, and Fürstenfeld doesn’t disappoint on that front; the game doesn’t feel strongly like any other game I’ve played. Which means that I’m quite pleased to have played it a few times – when a game isn’t a keeper for me, it’s a far better experience if it offers something new. And for that reason, I would recommend trying the game. I can easily imagine the mechanisms making the game a keeper for many gamers, particularly if the small decisions that drive the timing of the second pass through the deck are more interesting for others than they are for me. 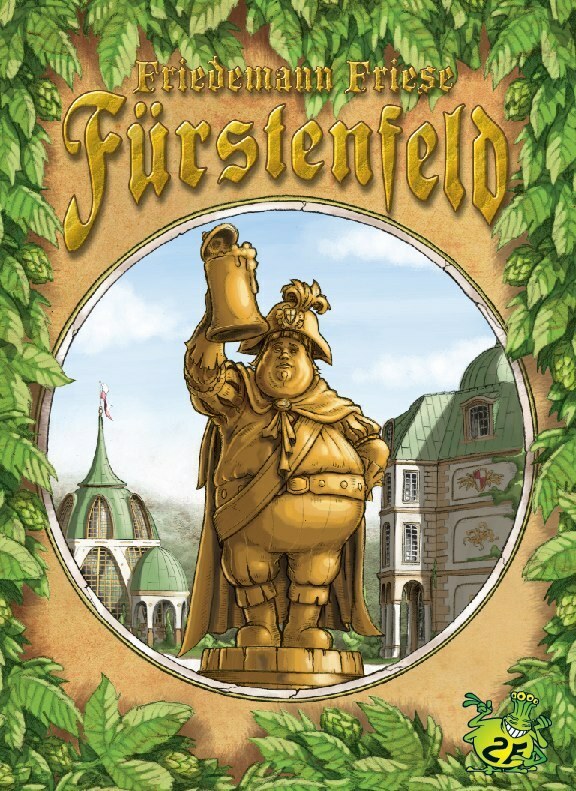 For those looking for a reason to give Fürstenfeld a try, it is a nicely produced game. The water, hops, and barley are represented with well shaped wood pieces, the money is wooden coins, and the cards are well produced. Oddly, the board on my copy bubbled a little; I haven’t seen that on other copies, however. I would recommend that those who enjoy nicely produced light business games and like the theme check it out. For me, however, the game just doesn’t stack up with other Essen 2010 releases – including others from Friese. After my first game of this — at the RGG stand in Essen, as a 2er with only the Basic rules — I was almost convinced to never play it again. After some cajoling from the other guys in my local game group, I have given the game a second chance — and I’m glad that I did as the game has a bit more depth than I had initially thought. However, after playing twice more, I doubt that there will be much more desire to play the game. 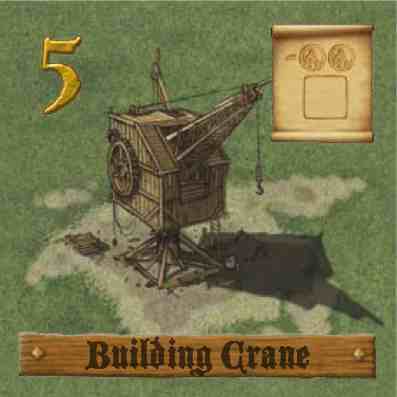 +1 bonus or the Crane which gives you a $2 discount on building buildings. Both of these cards have appeared strong enough to unbalance the speed at which particular players could start building their engines. Then, at the end-game, the game seems to be determined by whichever player (of those that got off to a fast start) were able to draw the estate cards in the right order. And – while I’m normally a gamer who doesn’t mind a good dose of luck in his games – for some reason, it bothers me here. I think that it might be because I want a market game to be meatier – more like Funkenschlag than this game. It works nicely enough, but it’s just repetitive and the endgame seems overly luck based given its nature. You start with an income engine of 1 of each of the 3 different resources, which you sell in one of the markets. Each market gives a price for each of the 3 resources which will go up if under-utilised and down if under-utilised. With the income, either buy one of the 3 buildings in your hand onto your personal tableau or save your money. Each player has an identical deck of building cards, and the decision each turn is whether to build one of these or hope for better cards next hand. With only 2 drawn each round, you’re either going to get lucky and get buildings you can afford for a strategy you’ve started down, or not. Anyway, your aim is to initially produce a lot and make lots of money, and the buildings will produce more goods or reduce building costs or allow you to churn faster through your deck or warehouse goods from turn to turn, you get the idea. Eventually you need to make enough money to afford to be able to replace your income engine / buildings with the 6 non-producing palace cards, first to do so wins the game. As you get to go through your deck several times, if you work at it, you can remember exactly when those palace cards will re-emerge into your hand and save accordingly. I’m not sure I want to work that hard. The defining question turns out to be will that final palace card re-emerge from the deck just when you’re cashed up and in a position to build it or will you be forced to wait a bunch of turns for it to come out and will someone else get luckier with their timing? That seems a lot of end-game luck. The building decisions / strategy you choose can vary quite a bit, but it’s driven by what comes up in your deck early and what you can afford. At least they provide a measure of interest in continued replay. But the rounds are endlessly identical – income, sell, build/save, income, sell, build/save – and I’m just not sure it’s an end-game I want to rely on once I’ve invested 60 minutes in a game. My experience seems to be quite different from the others. I quite like the game, and I’d say most people that I’ve played with like it as well. A couple have even loved it. There is a caveat here, though: I have always played the basic game. That’s because every game I’ve played has had a newbie in it, and this is one where you really do want to play the basic game first. I do know the advanced game, though – it’s not much different and my opinion would be the same. Many of the problems that the others have pointed out don’t appear to me as problems. I think of them as challenges. I’ve played quite a few times, and each time the cards in my deck have come up differently. Sometimes they order they come up has been less than desirable, but the challenge there is to make it work – and I have made it work, and won, quite a few times. Dale and Patrick have an issue with the luck of the draw towards the end of the game. I completely disagree with this. Since you get to choose the order of the cards you discard to the bottom of your deck, if you have any brains at all you’ll stack them to your advantage. That means you should generally know how they’ll come up towards the end of the game. That’s not luck, that’s strategy! Anyway, I’m very pleased with the game and am happy to bring it out when I need a medium-weight game that plays in an hour. My experience with the Basic game was quite poor (money was far from scarce, so it was just a matter of seeing who got to their Palace cards once they had made their stash). I was told, however, that the Advanced game was the proper way to play, so I agreed to try it that way before swearing the game off. And it is definitely an improvement. By the end of the game, I saw glimmers of how things can be manipulated. So this is a game I’d be willing to play again. But right now, I’m not terribly enthusiastic. I think it may well come down to good fortune, but for reasons different than those cited by my fellow OGers. For example, I don’t think the opening cards are that crucial; in both games, one player got off to a terribly slow start, but one won and the other barely lost in a tiebreaker. There are quite a few ways of acquiring the money you need to build your palace, and while it’s nice that there are multiple paths to victory, the fact that they seem to work almost equally well means that small things can determine the outcome. For example, in my last game, the winner benefited because the other players were forced to cover up the production cards of the kind he was still producing. So he was able to get top dollar for his crops each turn, simply because of the way his opponent’s Palace cards came up. I don’t think anyone felt cheated and the winner played a solid game, but it was a little dissatisfying that that provided the margin of victory. I also disagree with Joe that the markets don’t drop significantly throughout the game. Of course, we may disagree on the definition of “significant”: this is an efficiency game, so a price drop of $1 per unit could well prove to be significant in the right situation. In my first game, there was a lot of good screwage, as players were able to take advantage of their warehouses and manipulate turn order to their advantage. It may have helped that the three crops were a bit unbalanced, so there were natural shortages and surpluses. Of course, I, the winning player, had some good banks in play, which gave me money regardless of my production, so I was able to work around this. But the market still had an effect. In my second game, the winning player went with a huge production strategy, so there were some big swings. 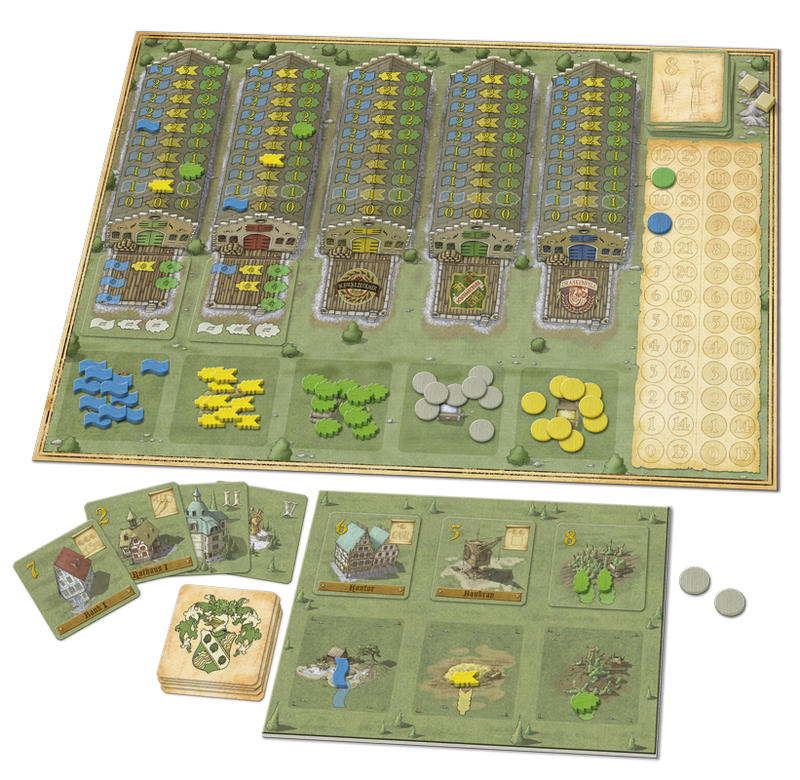 There was also a couple of Market buildings in play, which allows you to convert up to three of one type of crop to another before selling; obviously, that can lead to big swings. So I think the market mechanism works, but it’s just one of many ways of making cash. It’s a sound game and there’s a goodly number of decisions. But I’m unconvinced if those decisions are the biggest factor in determining who wins. The game has some very enthusiastic fans, so that, along with my respect for Friese’s design abilities, leads me to suspect that with more plays, I’d be able to navigate things better. However, at this time, the game isn’t really enjoyable enough to warrant those extra plays. I might be missing out, but there’s only so much game time and right now, I’d prefer to devote it to other titles. This entry was posted in Reviews and tagged 2f, friedemann friese, furstenfeld. Bookmark the permalink. My main problem with it, is on my third play I decided I had a good handle on the strategy, save up and buy a good buildings… and I solidly won the next 3 plays by only building 3 or 4 buildings, and then saving up and buying the end game buildings. But it makes it a far less entertaining game when most turns are simply sell goods, and then pass. So I’ve decided to sell my copy, love the concept… just not quite polished enough in the execution. – Neutral. It is very interesting for me to read all these opinions on my game (and all the other opinions on other websites). The most irritating part for me is, that for almost every card in the game there is at least one gamer thinking, it is the card you absolutely need (early in the game) to win the game. And I’ve even heard that this game is overbalanced, so no card is better than any other. For me the game is always challenging, because I do think each card has a special value for the game and it depends on when you get it and so I always have to use different cards, because I can not always start with the same combination. It is absolutely true that you normally only go through the deck 1 and a half times, so you have to take care what to do with your palace cards. The management of the palace cards is the main challenge in the game and everything else is built around it. For some people this means fun and for others it is just neutral or even produces negative feelings. I’ve only had one game, and thoroughly enjoyed it. In the words on a famous IGA member, I found the decisions interesting – both in terms of how I sculpted my deck, “beanfields”, and the market. I’m really looking forwards to exploring this one further, along with Famiglia. I didn’t include it in the article, because there wasn’t really a conclusion to the point, but everyone I’ve played with has looked to the crane as a “required” early purchase. But when I was thinking about the game, I realized – it’s neither required nor overly powerful; it just looks good. Even the warehouse _can_ be worthwhile in the right circumstances – but that depends upon the overall play of the game, and not just individual choices. In Larry’s games, where everyone is pushing production, the warehouse certainly does have value (though I’d opt for banks and the tourist bus, if others were producing heavily). And Doug – I found the game enjoyable through the first few plays. I just found that there wasn’t enough variety for me in the overall play of the game. Even my most recent play – where I decided that I didn’t need to own the game – was pleasant enough. An interesting comparison for me is with Factory Manager. There is a similar level of variety in the two games, but in Factory Manager the pure market focus helps it to remain interesting for me, whereas here the fact that one’s economy _isn’t_ the full point actually makes the game less interesting. I think the binary nature of the winning condition also detracts for me, come to think of it. Still a fine game, though, and one I have an easy time understanding why others enjoy. I’ve just had the one play and I really liked the mechanics and am looking forward to another play. The only other comment I have about it, is why a Palace? Shouldn’t it have been a Beer Hall? Two games now, half way to the Huber Limit of four. Very well received so far. Fun super-filler.